Who Won The 9/16 Debate? This from the Aaron Borders campaign. 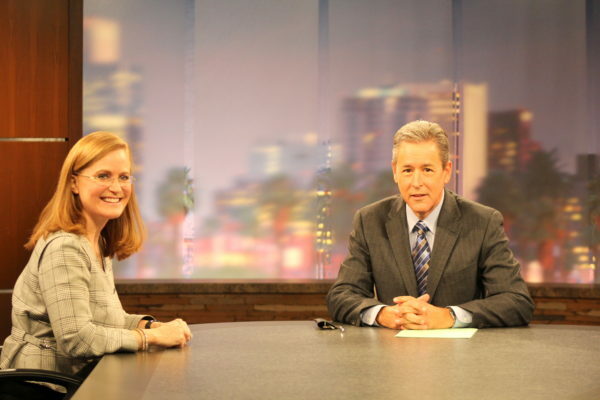 Watch as Ceci Velasquez explains why she is the most unqualified candidate running in LD-29. The Democrat Party should be ashamed of itself for putting her up as a candidate without any grooming or training. They have embarrassed her and themselves. 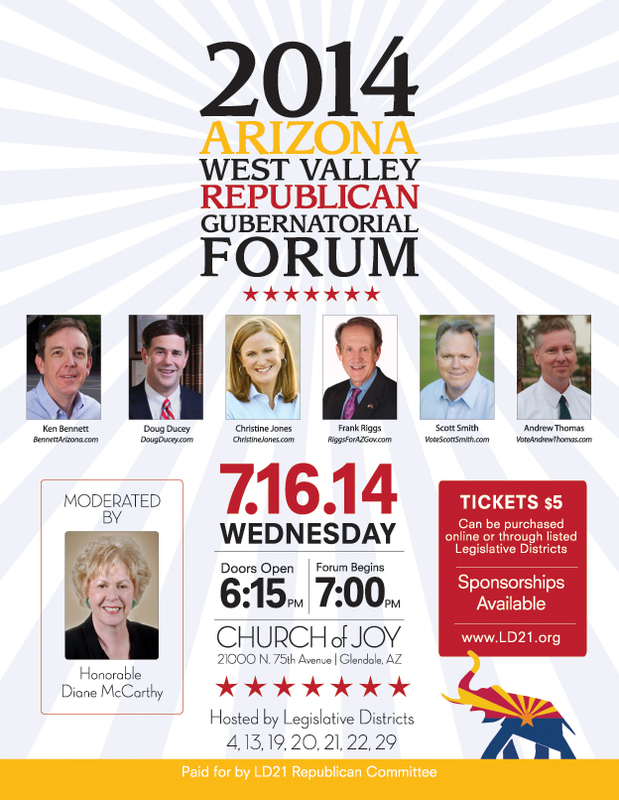 Arizona GOP Attorney General Debate Tonight! Tune in to Arizona PBS Channel 8 at 5:30 tonight as Mark Brnovich squares off against Tom Horne in the Attorney General debate. Those watching can live tweet your thoughts, comments and cheers by using the hashtag #AZAG. And if you want to follow the candidates, their Twitter handles are @Mark4AG and @TomHorneAZ. So You Want To Be A Legislator And Support Religious Liberty? Some folks just want to blame the Mormons… Like Kay here. She is a former member of the church who thinks it is a cult. Of course, Kay also thinks the majority of GOP legislators are LDS, and she intends to make sure that everyone knows that. Shane wouldn’t blame the Mormons, because he likely considers it narrow-minded to blame just one group of Christians when you can blame ALL of the Christians. Jett seems less upset at organized religion and more upset at the Bible itself. A lot more upset. Bart here is apparently still smarting from losing his job as a nutrition counselor. In fairness Bart, we’re pretty sure that’s not the 5-A-Day plan most people think about. Ciaran was in a bit of a hurry, so we just get the short and sweet from Ciaran. It gets weird when Ciaran seems to have some inside knowledge though. First you want him to die, then you celebrate that he’s almost dead? Does Ciaran know something we don’t know? Comparatively speaking, David here is one of the good guys. He doesn’t want Melvin dead, but he’s liking the idea of tracking down a State Senator and beating him, you know, “for good measure”? James wants lots of people to die, so it isn’t personal, okay Senator Melvin? We mean, he does want you to die, but he also wants lots of other people to die. Richard seemed like a pretty good example of the basic profanity laced “I wish you were dead” comment. Not exactly Lincoln-Douglas, but we’re sure he’s doing the best he can with what he has. And what would a leftist outburst be without invoking a Nazi reference or two? Gary, what’s with that profile picture though? Seriously? Remarkably, it looks like part of Melvin’s team actually took the time to respond to this guy. They probably didn’t make that effort twice. Chris is not pleased. Now Chris wants Melvin’s people dead. 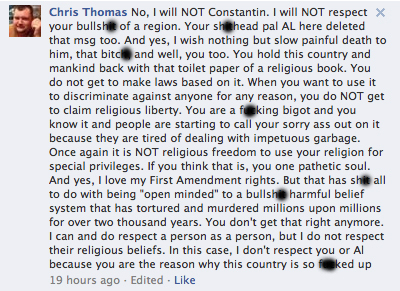 Also, Chris would like to add his voice to those who do not like the bible. We know, you’re shocked. Chris and Kay ought to talk. Chris doesn’t like Mormons either. He wants them to die. Graphically. In fact, he’s already decided how he wants them to die. We think we speak for civilized society at large when we say we’re glad Chris doesn’t have it his way? Looks like Melvin’s campaign started deleting Chris’ comments. Well OF COURSE they did! We’d recommend not just deleting them, but using the BAN feature offered by Facebook. Apparently they didn’t go that route, because Chris is back and he wants Al Melvin DEAD, weirdly enough, with the bullet that hit Gabby Giffords. Although he’ll apparently settle for a .357 round. Point taken. And if it makes our blog readers feel better, Chris Thomas, like most of the folks captured in this post, isn’t even from Arizona. That makes us feel a bit better, even if now we have to feel sorry for Chesapeake, Virginia!